In 2004 we lost our little Main Street Abby. We decided to rescue and in July 2004 we adopted our little blind Yorkie Teddy Bear who was only 9 months old. He was doing well but our other dogs were getting older and did not have much interest in playing. I looked and looked on Petfinder and one day I saw a little Maltese named Gordon that was in New Jersey and had been abused. I called to inquire and they told us to come meet him. John took off of work on his birthday and we made the 3 hour trip to meet him. He had been at the vet for 10 days in very poor condition because some idiot poured bleach all over his body and his skin was damaged and his little eyes were also damaged. His mouth was full of ulcers and infection as he tried to lick off the bleach. He went to foster care and they continued to nurse him back to good health. 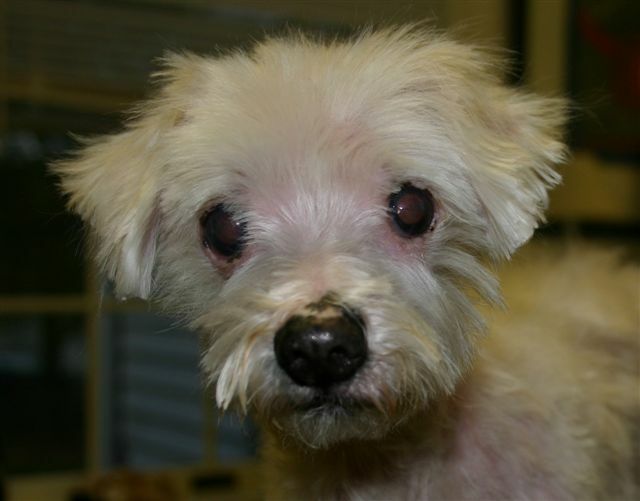 This was what Animal Alliance had to say about Jack–Jack Frost came to us late at night from the shelter weighing a skeletal few pounds, barely able to stand, a woeful and sad shadow of a dog that had been “bleached” by owners that thought it would make him white. Jack was on fluids and was fed around the clock until his triumphant exit from the animal hospital as he proudly walked away to go to foster care. When we called and inquired they told us of his the horrible story and that his eyes were still sore and he had scabs on his body and little hair on most of his body. When she handed him to me he looked right in my eyes and then started to lick my face. There were tears in many eyes that day as we all knew Jack had found his forever home. We stopped on the way home and got him a hamburger and a cool drink of water. When we got home Teddy was thrilled to have a new friend. Jack bonded with him right away and they began a life of fun and tug of war and tearing up paper whenever they could find it. Teddy was still growing as he was so thin when rescued and just 9 months old. Teddy grew to be about 22 pounds and the “big” Jack was 6 pounds. They were the best of friends and always together. Jack stayed with Teddy in the fenced yard and we could see that he was learning to look out for his blind brother. They enjoyed a year and a half and then Jack seemed to feel weak. A visit to the vet showed he was going into kidney failure. We started meds and learned to do fluids at home. He got somewhat better but then after about 3 months he was failing. We knew it was time to let him go to the Rainbow Bridge. The night before we took him to go to rest I held him all night. He didn’t sleep much and neither did I. Once again those beautiful eyes although not as bright as before looked me right in the eyes and the sign I was looking for happened. Jack was letting me know he was ready for the final journey. The little boy that fought all the odds to survive was no longer able to fight. We took him to the vet to be put down. He went peacefully. When we got home we let Teddy sniff him so he could hopefully understand that he was gone. He laid beside him for a little while and then we buried Jack in our backyard with the others that died before him. It was a day of terrible sadness. Our little hero was gone. We know that Jack fought hard to find that forever home that he knew was there. He had almost 2 years of love and joy and not having to eat out of trash cans like he did on the streets before we was rescued. Teddy missed him so much! It was so sad to see him wonder where his buddy was. Then finally Luca our other little Maltese seemed to get the idea that Teddy needed a friend and he stepped up and filled in for Jack. So many loved Jack and prayed for him when he was sick. Our hearts were broken that day when we said good bye. I do know that Jack was once again pain free and his little eyes could see clearly once again. It was a gift to us and a gift to Jack that he lived his last 2 years with us. I sure wish he could have been here his whole life so he would not have had to suffer like he did before rescue. Rescue can we very hard and heartbreaking but it can also be so rewarding to see this little guy get all his hair back and his eyes cleared up. He would run through the house so fast and slide across the floor. He always had joy and he never forgot the habit of eating out of the trash can as he would stand on his hind feet at our trash can just to look. Such a great little man and the bravery of a giant all rolled into this little 6 pounder that loved life. He will forever be in our hearts and I smile every day when I see the beautiful painting my friend Marie had done of him. Jack you and Teddy got us started on this journey of rescue and we are grateful to you. I can only imagine how thrilled you were to see Teddy when he came to heaven a little over a year ago and for the very first time Teddy was able to SEE you. I know that was a great reunion. Rest easy little boy we love you.